An accessory of Duchess Kate’s that I always look forward to with much enthusiasm is her choice of tiara for special occasions. Whether it be the Lotus Flower tiara she wore for the Chinese state banquet in October 2015, the Cartier Halo tiara for her wedding, or most recently, the stunning Cambridge Lover’s Knot tiara, few pieces are more exquisite. I will always remember how regal I felt when my own wedding tiara was placed upon my head in 2009. I never wanted it to come off! Nevertheless, the day after we said our nuptials it was retired to a special spot in a drawer on my nightstand and has remained there ever since. Flash forward to Near Year’s Eve 2015. My sister-in-law and brother-in-law joined us to ring in the New Year and brought with them an NYE party box full of noisemakers, black leis, and paper hats and tiaras. That’s when it struck me. Why not bring out my own tiara! I ran up to our bedroom and unearthed it from its rest. It gleamed and glistened as beautifully as ever! I placed it on my head and arranged my hair around it. Perfection! There it stayed into the wee hours of the morning. Again, I was disheartened when I placed it back into its resting spot. While I’d love to wear it every day, even Duchess Kate doesn’t wear a tiara that often. Besides, if I did, then I fear it would lose some of its allure. That’s when the idea struck me that I don’t take advantage of the opportunities I do have to wear it! I’ve compiled below seven occasions when we can wear a tiara. As I realized, on this day anything sparkly goes. Whether you are hosting a party at your own home or spending a night on the town, use this as your first opportunity of the new year to let your inner Duchess shine. I believe that there can’t be too much glitter and glam on this evening! 2. May 24th: International Tiara Day! Need I say more? International Tiara Day is celebrated on this day each year, appropriately on the birthday of Queen Victoria. Since so many people admire tiaras, but there are very few events to which one can appropriately wear one, International Tiara Day was created. It is a day when everyone who wishes can wear a tiara for a day and feel like royalty. It’s a day to for you to celebrate being a capable, empowered, and intelligent leader who is in control of your life. 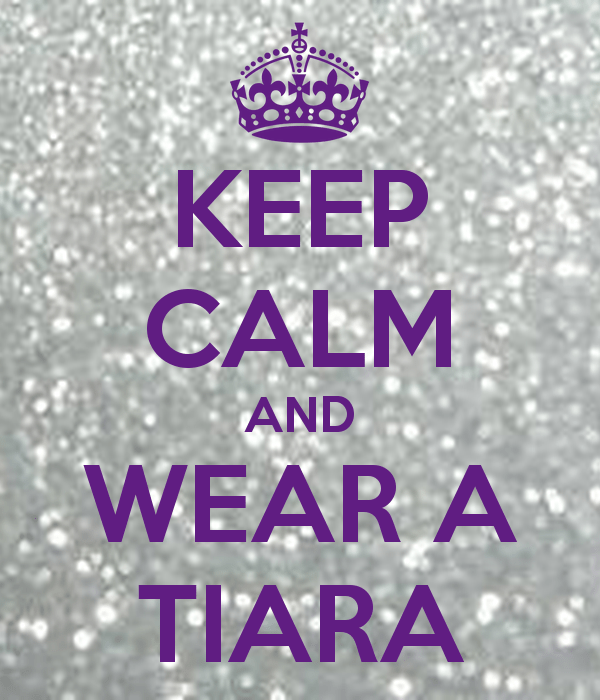 Keep calm and wear your tiara! You’re Queen for a day! Go ahead and place that tiara on your head; especially if you have a night out planned with friends and especially if a limo is involved! It’s your day to feel special, beautiful, and royal! The day you are a princess. The quintessential perfect event to wear a tiara. There are many websites featuring articles on which style and type of tiara to match with the dress, the veil, and even the jewelry. Have fun choosing! If you’re in high school, this could mean your prom. There are even “Mom Proms” as a means to have an excuse to wear a ball gown and tiara. Or maybe you’re attending your bachelorette party? Perhaps your graduation party? If it’s all about you, feel free to let yourself shine! There is a historic Victorian mansion near me that hosts teas to which one can dress the part. Fancy hats are always welcome! This weekend I will be attending a Downton Abbey tea where I fully expect to see many ladies and gents not only wearing vintage and vintage-inspired hats but period-appropriate dresses and suits as well. I’ll be wearing my tiara and channeling my inner “Lady Mary” (pun intended). I recommend researching events in your area to see if you have any of the like. If you don’t, create your own tea for friends and advise that tiaras will be worn! You could hold one indoors on a cold February day when everyone needs a little pick-me-up or perhaps in the summer shade. Whether you’re a mother, a devoted aunt, or the like, you’re Queen of your castle so you have complete permission to let yourself shine. Praise yourself for the care you take with others and dote on yourself a bit. Therefore, by direction of this article, I give you permission to cause a stir and reward yourself on special occasions by adorning your head with a little something extra. You may very well inspire someone else to do the same. Can you think of any other occasions when a tiara can be worn? Mary is a contributor for What Would Kate Do?, has a B.A. in English, and is pursuing a Master in Business Administration. She also works full-time outside the home and has a son the same age as Prince George! She enjoys knitting and crocheting, reading, and going to tea houses.